In a small sauce pan over medium high heat add the juice from your Chestnut Hill Farms pineapple, brown sugar, honey, and ginger ale. Cook over medium high heat until sauce thickens slightly, around 5 -10 minutes. The last 30 minutes of cooking time remove ham from oven. 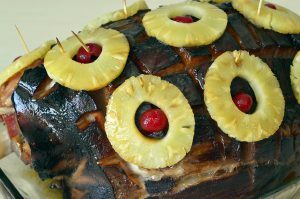 Place the pineapple slices all over the top of the ham and in the middle of the slice secure a cherry with a tooth pick. If using the clove stick one into each cherry. Baste again and bake uncovered for 30-45 minutes so that the ham and the pineapple reveal a golden color. This entry was posted in Featured, Latest News, Recipes and tagged christmas, christmas ham, farm, ham, holiday, pineapple, recipe, recipes. Bookmark the permalink.